Will June’s Final Teams Bring Back The Magic? Why don’t we rank the best NBA Finals? You can’t walk a straight line in bookstores without stumbling over some Greatest Super Bowls tome or The Fall Classic: We Remember solemnly poking out from the shelves. The NBA’s championship is far more suspect, the nature of the game makes seven taut games nearly impossible. Stars, or even simply good players, on a championship team account for 20+% of a team’s output on the court. Losing that for one game mostly ensures defeat. Home court is also advantageous for an NBA team in the playoffs more than hockey (where just playing seems to be the important thing), football (no home advantage in a Super Bowl), or even baseball (pitching matchups dictate advantages). Look at the New Orleans – San Antonio series, with seven grueling games providing a dinghy’s worth of highlights. Every other game was a blowout, double digit homecourt slapping, while only Game Seven met its classic billing, where a road team actually won a close game. Jannero Pargo missed a 3 pointer to tie the game up with two minutes left, Tony Parker glided over a Tim Duncan screen and stroked a j, and that was the whole piñata. The final result exists like some propaganda; the Spurs only won because someone told you they did. Who are you to remember any of it? 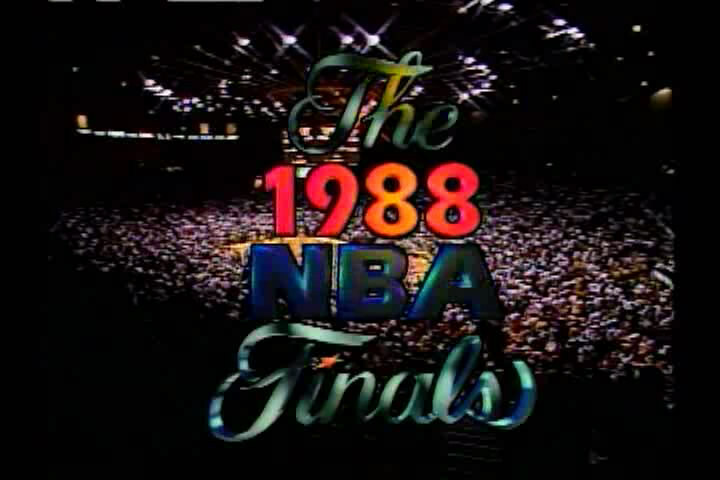 Memorable, however, certainly describes the 1988 NBA Finals, and with the Pistons and Lakers still fighting through the May muck, I thought to revisit it. Interestingly enough we could have a very similar matchup in 2008 if Detroit and LA gag it this week. Twenty years ago the Showtime Lakers were a juggernaut, gunning for back to back crowns (not since 1969) and the fifth title that decade. Magic Johnson, Byron Scott and James Worthy paced the offense; the aging Kareem Abdul-Jabbar took a backseat. The veterans won two exhaustive, consecutive Game Sevens to head back into the Finals. That sounds a good deal like the aging San Antonio Spurs, whose big stars have lifted the load equally all season. Ginobili, Parker, and Duncan have all averaged just about 20 points in every game. Back East, the brash Detroit Pistons dethroned the old guard Celtics in six games to contend. Detroit had a skillful blend of six above-average players: Isiah Thomas and Joe Dumars provided scoring, ballhandling, and defense; Adrian Dantley and Vinnie Johnson were interchangeably shooting the lights out, and Dennis Rodman and Bill Laimbeer could rebound and give the crowd someone to despise. Laimbeer foreshadowed the modern European players, despite being from California; he was a seven footer that could play outside and hit the three with regularity, and he never once committed a foul in his life. Very similarly, the 2008 Boston Celtics are the new kids on the playoff block. The Big Two of Kevin Garnett and Paul Pierce now feature Ray Allen and Rajon Rondo on some nights; most importantly, their skillful and damaging defensive schemes rival the Bad Boys’ heyday. The series was a tight affair from the opening tip. In Game One Detroit thumped the Lakers in the Great Western Forum, only their second double digit home loss all season. 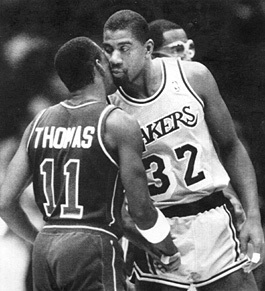 Before the game Isiah famously smooched Magic at midcourt, and during the game Isiah set to kissing him g’bye. Laimbeer hit a three pointer with six seconds left in the first half, Isiah Thomas then stole the inbounds pass and hit another three pointer at the buzzer to push the lead to 17. It didn’t get much better. Dantley hit 14 of 16 from the field. In Game Two, both teams battled through injuries, with Laimbeer’s injured foot taking a backseat to Magic’s influenza. Johnson battled through the bug to tally 23, one of three Lakers with 20+ points. Michael Cooper held Dantley to 19, Thomas shot 5 for 14, and an inadvertently reset shot clock sparked a late four point swing with just over a minute. The 108-96 win was closer than it seemed; it was one of the six games the Pistons could very well have won all series. Heading to the Motor City, Johnson’s homecoming (born in East Lansing) was the story of the day; before Game Three the Lakers feasted on a homecooked Johnson family meal. Magic must have felt right at home, pouring in 18 and dishing 14 assists for a 99-86 winner. Coach Chuck Daly got the boot in the fourth quarter, but really he was ready to leave after the third quarter, where LA shot 65% and outscored the Pistons by the final 13 point margin. The tired Laker team had two left in Detroit; either game would put a hammerlock on the series and cement LA’s legacy. Neither one happened. Johnson’s newfound energy led to foul trouble; Johnson picked up his fourth foul in the third quarter in Game Four, later he cocked a forearm into Isiah’s face. The drubbing was the only one a Laker provided; Detroit rolled by 25. The Lakers responded two nights later, running up an early 15-2 lead, but the frenetic, physical pace played into the Pistons’ hands. After five minutes, Worthy had three fouls. By halftime, Detroit led by 9; after three, the game was no longer in doubt thanks to a 20 rebound Piston edge. Adrian Dantley scored 25, hitting 11 free throws, while the whole of LA only hit 19 for 33. The Pistons’ 104-94 victory came in front of 41,732 and closed the Silverdome’s basketball history with a bang. Detroit looked to stun the champs in the Great Western Forum, and they should have, too. The final two games featured enough close calls, enough twists and turns to spark two decades of whatifs. In Game Six, Kareem shot 3-14, Thomas poured home 43 points (25 in a quarter! ), and the Pistons held a three point lead with 53 seconds left and had three open looks in the final minute. How did it collapse? LA built up an eight point halftime lead, and Isiah’s outburst came amidst a badly sprained ankle, which limited his effectiveness once it began to swell. His quarter’s worth of points in the third remain the standard for Finals outbursts , featuring a rub your eyes raw hang and hit bank shot plus an and-one, courtesy of ‘87 Defender of the Year Michael Cooper. But it all unraveled late. Scott hit a jumper to cut the lead to one, Isiah missed on the other end, and Laimbeer nudged Kareem on a skyhook, fouling out with 14 seconds. The Big Fella looped two through the twine and gave LA the slimmest of leads, 103-102. Daly called Thomas’s number again, but Dumars had to force up a double pump and missed, and after mangling the last three seconds, they failed to get off a shot. Thomas, and the series, were doubtful for Game Seven. The superstar battled for 28 minutes in Game Seven, barely able to jog. He would contort his body into sparing bursts of speed, a real-life NBA Jam turbo. He could manage but 10 points, yet his presence pushed Detroit into the locker room up five. Thomas’s ankle tightened up something fierce after that, and in the middle of a 25-3 runaway, Daly benched Thomas for the final 12 minutes. With the Lakers nailing 11 shots in a row en route to a 36 point third quarter, most thought the game was over, and with 7:44 to play the lead stood at 94-79. But the champs, tired in their third straight Game Seven, endured a furious rally. John Salley connected on a three point play, Kareem picked up his fifth foul soon after, and a Johnson charge led to a Laimbeer jumper. The Pistons were down just 4 with 3 minutes left, too close for comfort. One play later Rodman halved the lead off a steal. With zero margin for era, the champs clamped down. Worthy (the Finals MVP picked a hell of a game for a first career triple-double) hit the offensive glass for a layup, and a late Johnson free throw held the lead at 3. An ill-advised jumper by Rodman and a giveaway from Dumars forced the young guns to foul. Laimbeer hit a huge three with :07 to provide hope, but Magic immediately hit AC Green for a last-second dunk. Isiah, back in for the very end and down 108-105, caught a pass at midcourt and either tripped or took a body check from Magic. For the second straight game, and the championship, the Pistons lost by failing to get off a shot. The Lakers belonged to the ages. 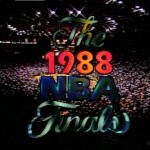 Will the 2008 Finals match the intensity, chaos, and talent of 1988? Probably not, but with three bonafide superstars still playing and such quality play this season, there’s no better time than now. What an odd note that the ’88 championship might be revisited two decades later, East and West, if its franchises lose their biggest games. Here’s hoping history repeats itself, sort of.